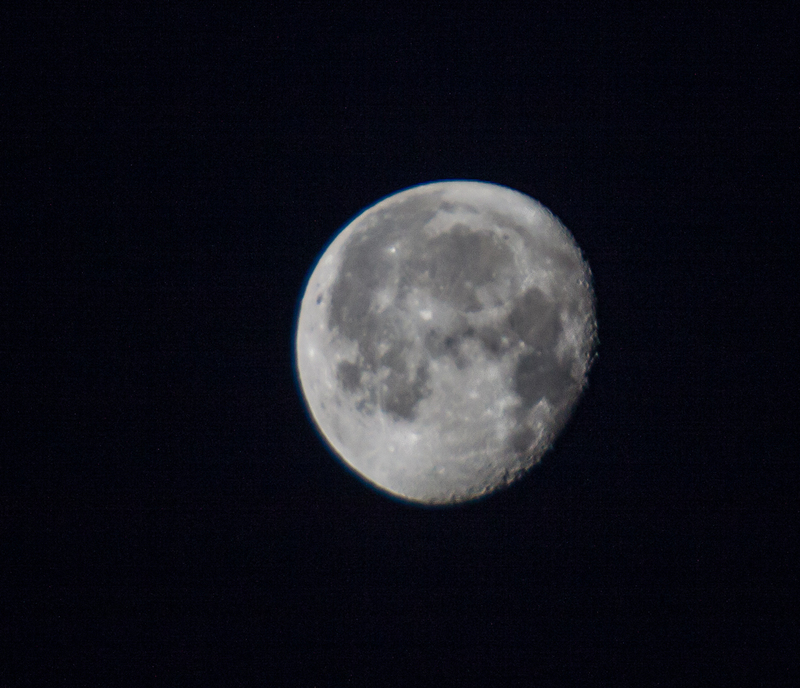 The moon looked amazing at 7:00 this morning when I went out to get my newspaper from my front steps. It was still dark and in the opposite direction, the sun was just beginning to rise. I rushed back into the house, put some socks on my sandaled feet, and ran outside with my camera to get some shots. I used the longest lens that I have, a Sigma 135-400mm lens, and leaned it against the roof of a parked car to stabilize it. 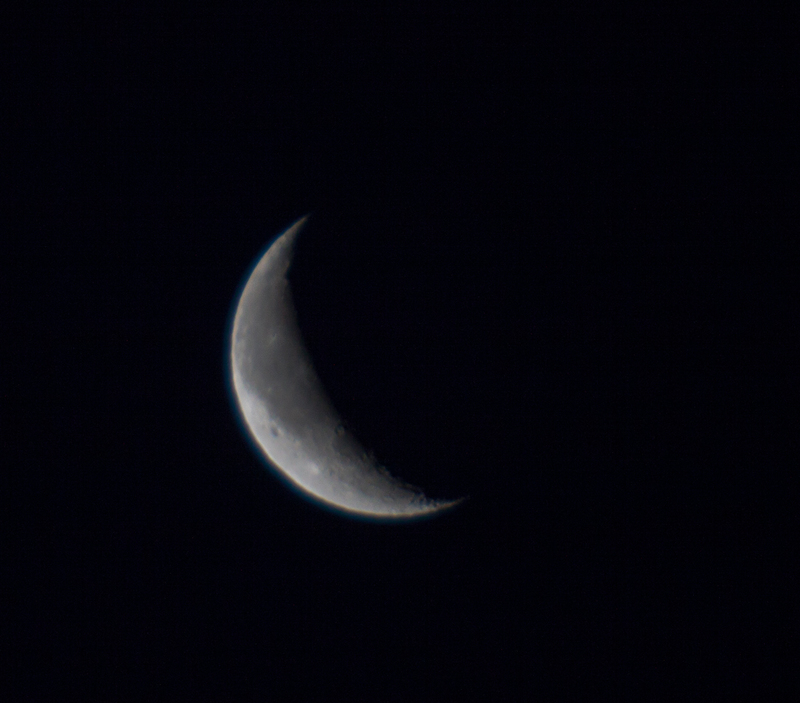 I was surprised at the detail that I managed to capture of the craters near the dark side of the moon. (I think the full moon was a few nights ago.) Click on the photo to see it in higher resolution. 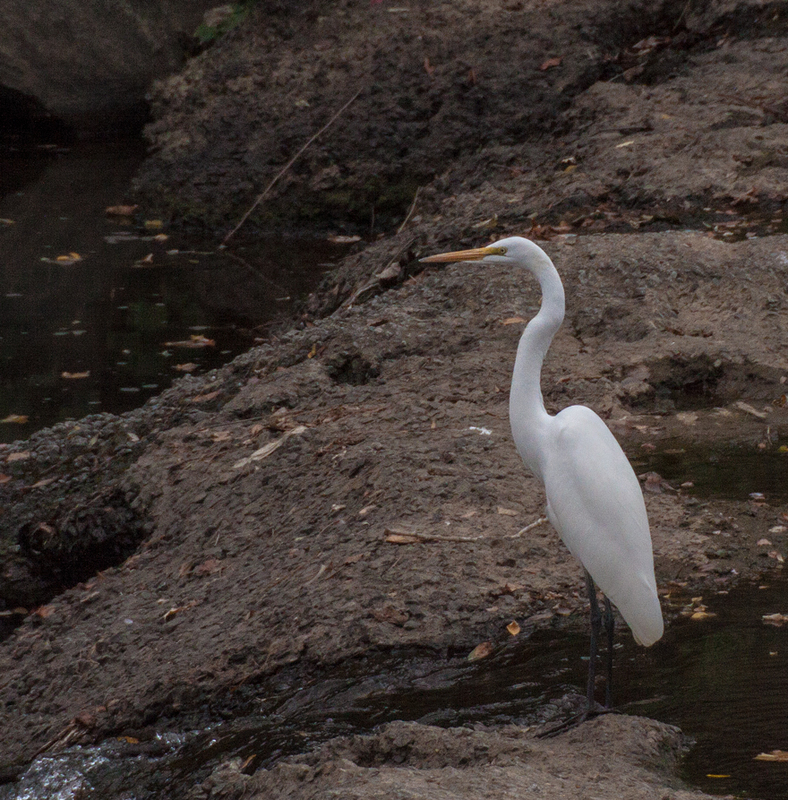 Before long, the White Egrets (Ardea alba) will leave this area for more temperate locations, so I was happy to get a few shots this past weekend of one of them at Cameron Run, a tributary of the Potomac River. 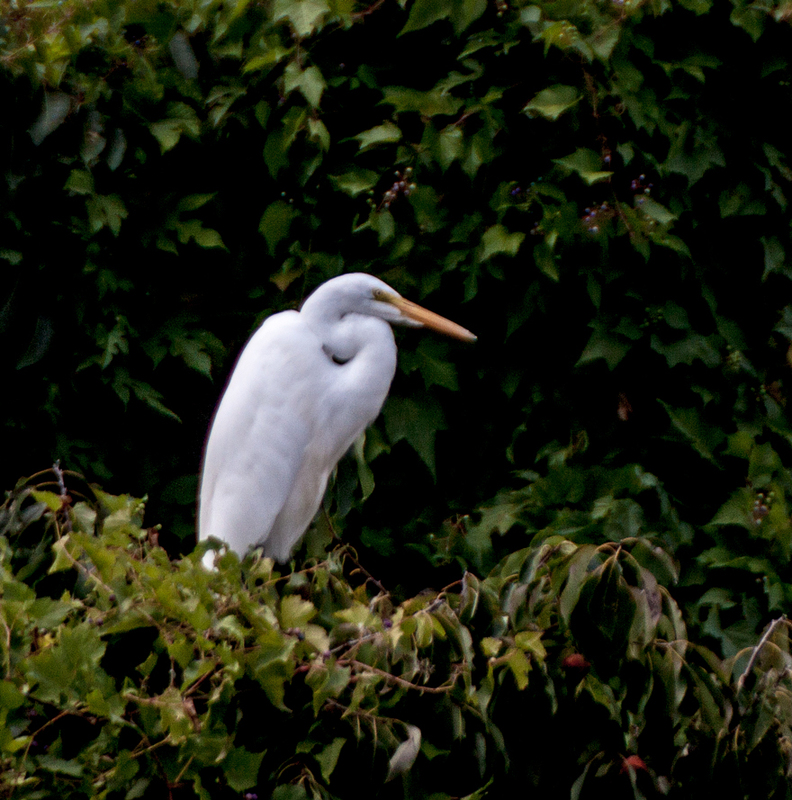 The egrets like to roost in trees that overlook this stream and the first shot shows an egret relaxing in a tree after I inadvertently flushed him. I am deliberately underexposing the image in an effort to keep from totally blowing out the highlights of this very white bird, but it is still very hard to capture any details on the body. The second shot shows the egret out of the water and its pose reminds me of a dancer, with its slim body and long elegant neck. If things follow last year’s course, the blue herons will remain in my local area for most of the winter, but the egrets and green herons will soon depart. I’ll be looking for more photo opportunities with them before they leave. 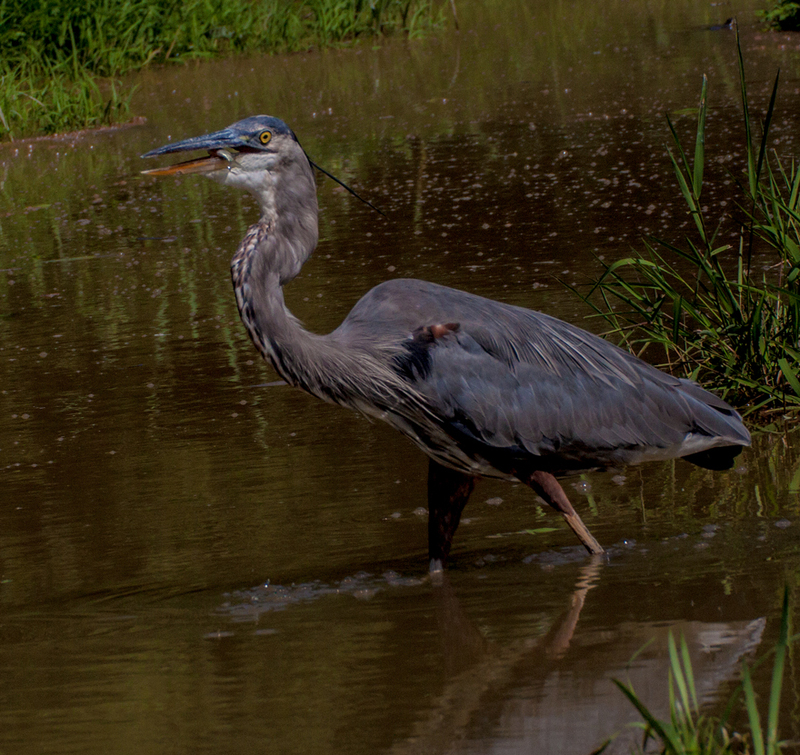 The Great Blue Heron stealthily moved into position and leaned forward, preparing to strike. Would he pull a great big fish out of the water? The second photo provides the answer. The catch was relatively modest, a tiny fish, dwarfed by the size of the heron’s bill. The heron obviously did not believe in the “catch and release” policy used by most fisherman for such small fish. 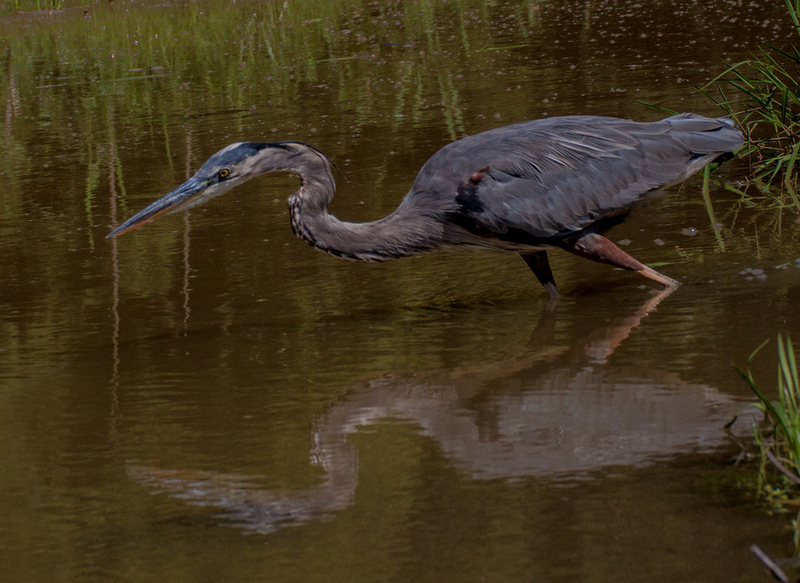 Turning his head back a little, the heron had no trouble swallowing the little fish. He even seemed to smile a little as he did so, content that he had been successful in his fishing. 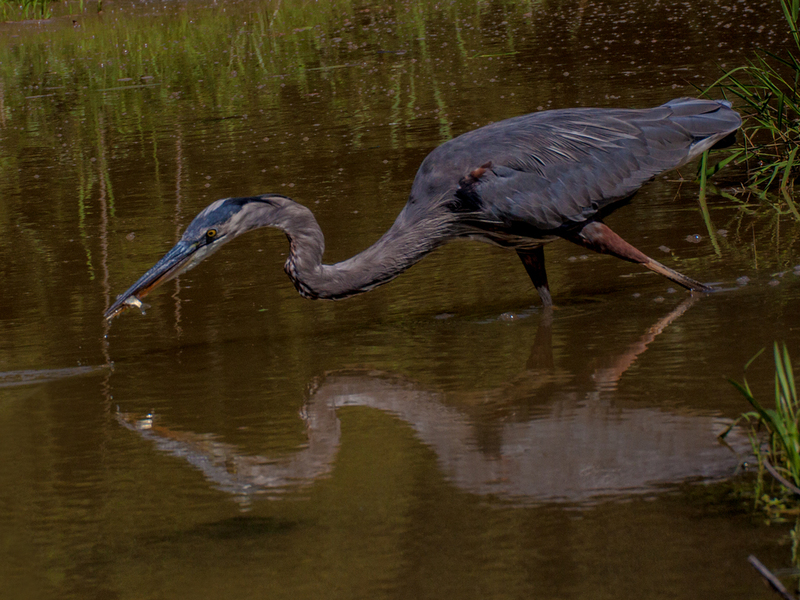 Having consumed his appetizer, the heron got back to fishing, hoping to catch a more substantial dinner. Do you ever take shots and find that you like the way that the background turned out even more than the way the subject looked? 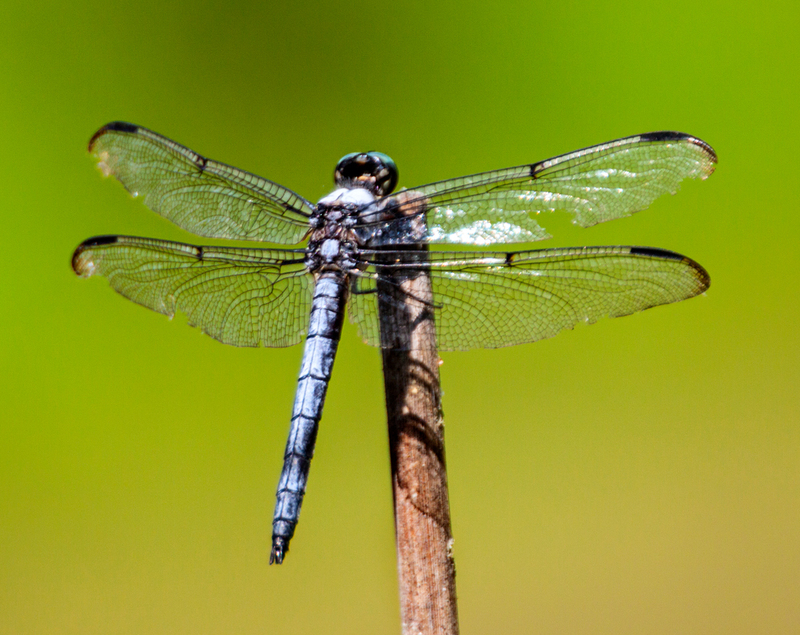 That was the case with this image of a male Great Blue Skimmer dragonfly (Libellula vibrans) that I photographed this past weekend. The lighting was a bit harsh and the pose is pretty ordinary, but I love the two-tone background, caused in part by the use of my 135-400mm telephoto zoom at its full extension. 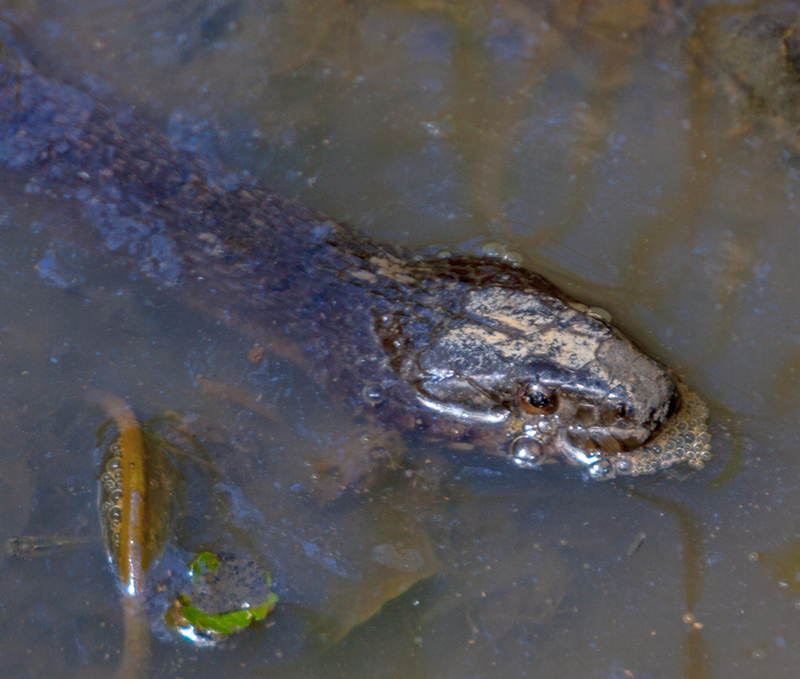 Do Northern Water Snakes (Nerodia sipedon) blow bubbles in the water for fun, like I used to do as a child? Does it help them to attract prey? Are the bubbles simply a result of the snake remaining semi-submerged in the shallow marsh water as it waits for its next victim? Whatever the reason for the bubbles, I spent some time yesterday observing this snake, hoping that I might see a successful hunt. In the end, I came up empy-handed, as the snake’s patience outlasted mine. Do Great Blue Herons (Ardea herodias) have a sense of humor? What would prompt one to burst out in laughter? Maybe one of the many turtles surrounding the heron’s feet decided to tickle them. (Click on the photo to get a better look at the turtles). Perhaps he is preparing for an audition for the reality television show America’s Got Talent. What’s his talent? 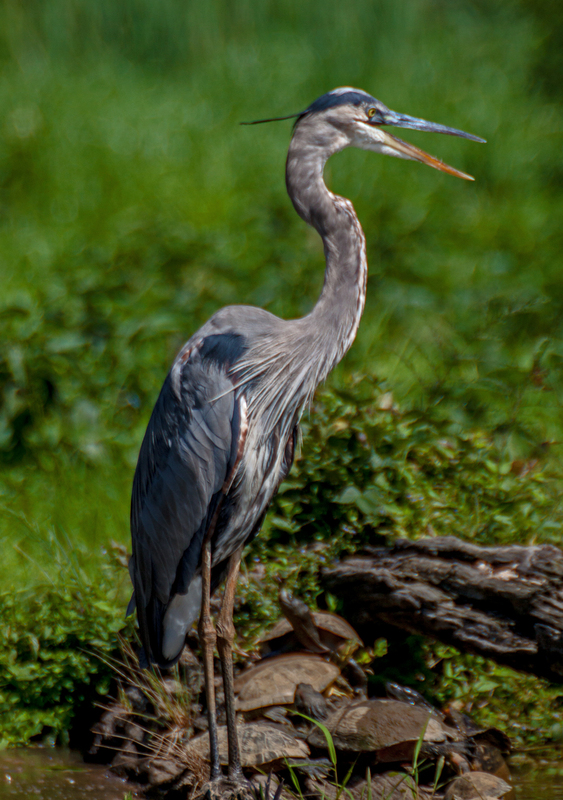 Judging from his appearance, I’d say this heron might have a future as a stand-up comic. I might have captured hims as he was trying out new material on the turtles, which are notoriously tough as judges—you have to be really funny to be able to penetrate those thick shells.